The theme behind these 5 reels, 20 payline online slot game is terrifying! The horror theming will have all of the hairs on your neck standing up. The game, which is developed by Yggdrasil gaming has some great additional features. These include sticky wilds, respins and free spins. Overall, the game holds a medium to high variance and can be played on all devices from 20 pence to 100 pounds a spin. Join the wolf hunters and play online slots of the highest quality! As always i-Gaming software develops high quality slot games which are focused on strong theming. EasySlots.com partner Yggdrasil, is a Malta based company that has being in existence since 2013 and aims to provide more thought behind the themes. To put in it context the company name is derived from Scandinavian Mythology and stands for a large ash tree, home to eagles and dragons. Their games showcase high quality animation which are multi-functional across a variety of platforms. The lower paying symbols include blue diamonds, green clubs, purple spades and red hearts and these are displayed on a wooden, rustic looking panel. Then the more themed symbols include the werewolf hunters stakes, traps and bottles of dangerous poison. Finally, as you might have already guessed – there is the might werewolf acting as the highest paying symbol. When the werewolf symbol appears, one of the hunters will try and kill it and if they succeed than you will gain a free respin (the werewolf feature). When the hunters hit the werewolf, they will decreed its life by 1. 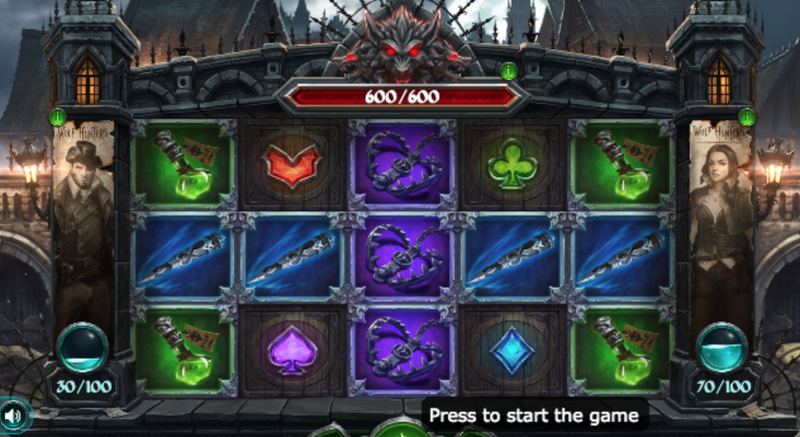 Hitting 0 will bring out the slayer free spins feature. Also, every hit from the hunter give them a point and once rage points hit 100, the rage free spin round is activated! Keep an eye on these tallys at the side of the reels so you have an idea of what is coming up. Free spins are a big part to this online slot game and there are 3 different features. For example, in the standard scatter free spins feature there is a generous 10 free spins and the chance to win even more! The rage is a free spin feature that rewards 7 free spins. Slayer free spins rewards 10 free spin rounds. The theming in this game is second to none, with extremely well-developed imagery and graphics throughout. It will be sure to give you a scare with the haunted buildings in the background. It is a great game to play because the 3 free spin features give you something to stay focused and motivated on. Yggdrasil gaming have provided a mix of scary excitement which will find you on a constant battle between routing for the werewolf and then the ones that are trying to kill it! Wolf Hunters invites you to go on a mission into the darkness and hunt for the ugly beast! Try more slot online games by Yggdrasil.